But I didn’t follow the recipe at all… I only had about 1/3 of the ingredients that was called for. So this fish curry was just the mixture of all I could find in my kitchen: horse mackerel, eggplants, tomatoes, onion, garlic, ginger, lemongrass, chili pepper, cumin, curry powder mix, salt& pepper, chicken stock, and coconut milk. I did find fish sauce in my fridge, but its expiration date was… no, I can’t tell this to the world. So I don’t think this deserves a name “Thai curry.” People in Thailand would probably get mad at me. 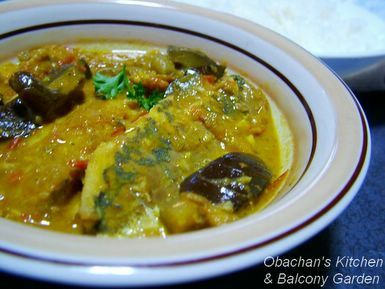 This is obachan’s stress-induced fish curry. That’s what it is. :P But to my surprise, it wasn't bad at all. I might try this dish once in a while… to prevent my freezer from being fully occupied with frozen fish fillets. Waow, I'd love to have so many fishes in my freezer! This curry looks very fine, no matter if it is not a traditional Thai curry! I wonder what kind of fish is popular over there. I wished I had nampla, at least. It would have made a huge difference, you know.